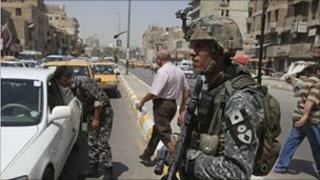 Iraq's prime minister has said the country is "independent" as the US formally ends combat operations. Nouri Maliki said the country's security forces would now deal with all threats, domestic or otherwise. US Vice-President Joe Biden is in Iraq on an unannounced visit at the official end of the mission, at midnight (2100 GMT) on Tuesday. In the US, ahead of an address to the nation, President Barack Obama said there was still much work to be done. "It is not going to be a victory lap. It is not going to be self-congratulatory," he said of his speech as he met troops in Texas. He also warned that there remained a "tough fight ahead in Afghanistan". The end to US combat operation comes despite continuing violence and instability in Iraq. The country's political leaders have so far failed to form a government after elections in March produced no conclusive winner. In his televised address, Mr Maliki told Iraqis: "Iraq today is sovereign and independent. "Our security forces will take the lead in ensuring security and safeguarding the country and removing all threats that the country has to weather, internally or externally." He assured Iraqis that the security forces were "capable and qualified to shoulder the responsibility". Violence in Iraq is down from the peak seen during the sectarian conflict in 2006-2007, although the number of civilian deaths rose sharply in July. Almost daily attacks on Iraqi forces and traffic police in Baghdad and Anbar province, west of the capital, killed more than 85 people in the first three weeks of August. These attacks may be a response by the so-called Islamic State of Iraq - an umbrella organisation of Sunni militant groups to which al-Qaeda in Iraq belongs - to the US military sending its combat troops home, says the BBC's Hugh Sykes in Baghdad. In an interview with NBC News on Tuesday, Mr Obama said the "lower and lower levels of violence" in Iraq were proof that the Iraqi security forces were "functioning at least as well if not better than any of us had anticipated". While many Iraqis have welcomed the withdrawal, others say they believe it is happening too soon and that the country is not ready to manage its own security. "It's not the right time," Johaina Mohammed, a 40-year-old teacher from Baghdad told the Associated Press. Media captionBBC's John Simpson: "This is a country that has been absolutely devastated"
"There is no government, the security is deteriorating, and there is no trust." One Baghdad resident, Ilifat, said that as long as any US soldiers remained in Iraq, he would consider it to be occupied. "When the last US soldier leaves Iraqi bases and no US base remains in the country, we will say that the US troops have withdrawn," he told the Reuters news agency. "Now the US army is still here and the country is occupied, and it will remain occupied. The country is also too weak." White House spokesman Robert Gibbs said the withdrawal marked "a change in our mission" in Iraq and that it was up to the Iraqi people to "write the next chapter in Iraqi history". "We will be their ally, but the responsibility of charting the future of Iraq first and foremost belongs to the Iraqis," he said. The last US combat brigade left Iraq nearly two weeks ago, well ahead of the 31 August target set by President Obama to cut the number of US troops in Iraq below 50,000. Those remaining US troops will focus on supporting Iraqi forces. Gen Robert Cone, the deputy commander of US troops in Iraq, told the BBC that the greatest assistance would be needed in the areas of logistics, command and control, intelligence, surveillance and reconnaissance. US troops will not participate in combat missions unless asked by the Iraqi authorities, or if acting in self-defence. "The reality is you can't be in those kinds of environments and solely be an adviser," Gen Cone said. "The soldiers that are left here... are combat soldiers but we're performing missions other than a primary combat role. "I can assure that every American that is left in this country has the right and responsibility to self-defence." Air cover for Iraqi ground operations is provided almost exclusively by US planes and helicopters as the new Iraqi air force is still in its infancy. All US forces must be gone by the end of next year. The White House has meanwhile urged Iraq to speed up political negotiations to form a coalition government after inconclusive elections in March. Talks between Mr Maliki and the former Prime Miniser, Iyad Allawi, whose al-Iraqiya bloc won two more seats than Mr Maliki's State of Law alliance, have repeatedly stalled. US Deputy National Security Adviser Ben Rhodes said the eventual government would have to be "inclusive and should represent the result of the democratic election that was held". "We believe that the Iraqis are making progress toward that goal," he told reporters on board Air Force One. Are you in Iraq? Is it time for the US combat troops to leave? What will the mission change mean for Iraq? Send us your comments using the form below.